To all Tesco Clubcard members! 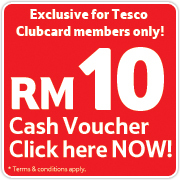 Get your FREE RM10 voucher now at www.tesco.com.my! Only two more days left to use them! How to get the RM10 voucher? Enter your TESCO club number and click "Submit". *If you don't see the voucher banner, please make sure you clear your internet browser cache/cookie and then refresh the page again. This RM10 voucher is valid when you purchase above RM100.